It's all about the three Rs. When Adam Goodes was a kid, he came home with a bad school report one day and his mum wouldn't let him play footy. No grades, no game. That was the rule in the Goodes household. Naturally this was tough on the young fella. And naturally, the future dual Brownlow medallist, dual AFL premiership player and Australian-of-the-year got a little upset. "I did cry a little," he told HuffPost Australia. "I was really sad that I was letting the team down. So for me I learned very quickly how important education was." The adulation of a nation, and all because of education. With his AFL career behind him, Goodes is now pushing the education message through to kids. He's working with the Australian Literacy & Numeracy Foundation, which is supported by David Jones, for whom Goodes is an ambassador. "To put it in really blunt terms, an indigenous pre-schooler is more than three times more likely to fail the basic numeracy and literacy level," Goodes said. People who have difficulty reading and writing suffer from shame, poor self-esteem and negative life experiences. They also lack access to many opportunities that most of us take for granted. ALNF exists to help these people by raising literacy levels in Australia's most marginalised communities. That's where Goodesy's trying to help. He's using his star power to encourage people to donate to the cause, which you can do here, or here by buying a book from David Jones (10 percent goes to the Foundation). Should you choose to help, here's what you need to know. 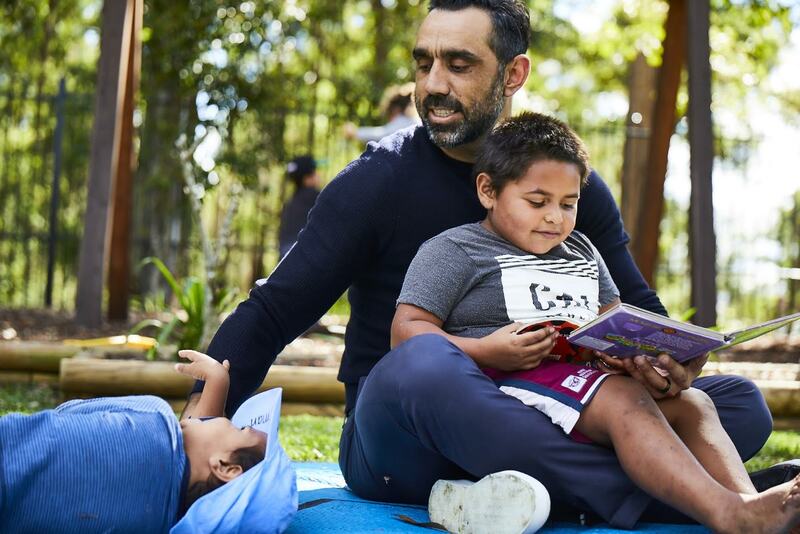 The money goes directly to projects which promote literacy and numeracy in indigenous communities -- just like the one Goodes visited in the NSW mid north coast town of Taree in the picture below. "I was up there in Taree recently at one of the schools where a ALNF program is running, and I'd never seen a bunch of pre-schoolers with so much confidence, running around, tearing around, so proud to even attempt to write their name. "I was just going 'this is fantastic, this is what it's about'. To see these kids going 'you know what? I can do this. I've learned how to do this, I know how to do it', not 'oh it's too hard, Miss' and walking away and sitting in the corner. "For me it's about building that confidence and teaching our kids that knowledge and education is very important. That's the story we want to keep telling. That's the story we want to tell the world." We're happy to help you tell it, Adam. And we're pleased that missing that game back in the day didn't appear to derail your football career to any great extent.